For the actual robots from the Custom Robo series, see Ray MK II and Ray MK III. The Custom Robo universe (カスタム ロボ, Custom Robo) is an action role-playing game franchise developed by NOISE and published by Nintendo. There are 5 installments so far, but only two of them have been released in America and only one has made it to Europe. The gameplay takes place within "holosseums", small virtual colosseums where two miniature robots battle it out with various guns, bombs, and pods. Several characters from Custom Robo V2, which was released in Japan only, appear as trophies. The Custom Robo games feature combat between small robots averaging about 12 inches (30cm) in height. Ray Mk II is the upgraded descendant of one of the combatants from the original game. It's a well-balanced Jumper model in the Shining Fighter line of robots. Its stable design lets it excel with a minimum of customization. Tsurugi and Yaiba, twin brothers who were bewitched by the dark power, combined their beloved robots Spear and Lance to form this illegal robot. The brothers used the Strike Vanisher model as a base, but then added a number of stealth capabilities. This successful power-up is nothing short of a Custom Robo miracle. Annie, a Jumper model in the Stunner line of robots, was the robot used by Nanase, a cadet at the Takuma Academy, a commander training school. At the climax of the story, Nanase fell prey to temptation and stained her hands with the illegal robot Majei. This act ultimately set the stage for her undeniably tragic end. The Ray Mk II trophy. Official artwork of Ray MK III in Brawl. Ray Mk III, hailing from Custom Robo Arena, appears as an Assist Trophy in Brawl. When summoned, it will fly to the center of the stage and fire either a barrage of energy bullets, or a singular missile. These bullets can be reflected or absorbed. Ray Mk III may occasionally fly slightly to the left or right, and fire another attack before returning to his original position. Ray MK III is unlocked as an Assist Trophy after 100 Vs. Matches have been played. The custom robo used by the main character. 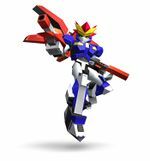 It's the latest Shining Fighter model in the Ray line of robots, which appears throughout the Custom Robo series. 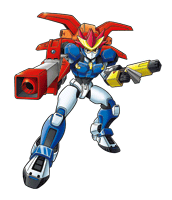 The main character switches from his beloved Ray Mk II to this model after his sister and father develop it. This one has a great balance between built-in abilities and ease and depth of available customization. Small robots. Custom robos average about 12 inches (30cm) in height. Battling of custom robos fitted with weapon combos—including guns, bombs, and pods—is a hobby of the future, taking place in a virtual arena called a holosseum. The different customization options allow for many battle strategies. Clearly defined regulations provide for a highly competitive activity. Highly illegal modified robos. The Jameson is based on the Lightning Sky. It and the A.I.R.S., a high-end Ray machine, can transform into fighter jets. The A.I.R.S. was developed for military use and thus cannot be used by all commanders. Both of these robos were available via DS Download Stations in Japan. The Ray Mk III trophy from Brawl. The Custom Robos trophy from Brawl. The Jameson & A.I.R.S. trophy from Brawl. The following characters from the series are spirits. This page was last edited on April 18, 2019, at 05:13.